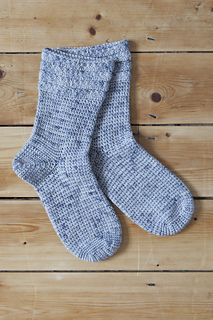 A cosy sock, perfect for cold nights, crocheted in a sumptuous cashmere blend these make fabulous bed socks and would make a luxurious gift. 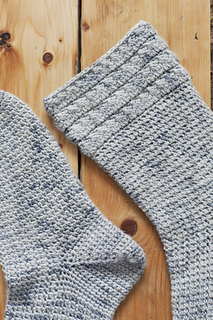 Crocheted toe up with a square toe, they use a tramline stitch and are finished with a snowflake stitch edging. Worked over an even number of stitches, in continuous rounds, without turning. Work in multiples of 2. Foundation Rnd: Ch number of sts required, join first ch to last ch with sl st, ch3, 1tr, 1dc, rep from to end. Rnd 1: 1tr, 1dc, rep from to end. Rep Rnd 1 as required.